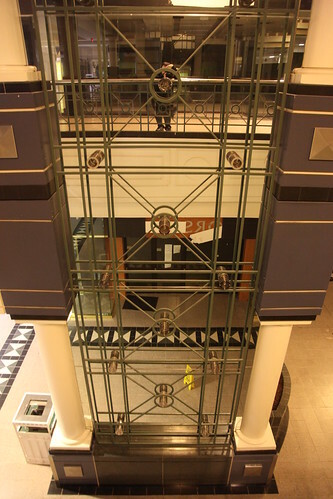 The center court elevator at the mall is a 1969 vintage Otis overhead hydraulic observation elevator. The other side of the hoistway is the glass side, this side is a mirror from top to bottom. Interestingly, despite being built nearly three decades prior, the hoistway features the brutalist lighting elements that resemble vapor proof industrial lights.